Nearly all businesses live by referrals. Whether its simple word of mouth or sophisticated sharing systems, humans are social animals and we share the world we encounter with those around us. The hard part is to find a systematic method that helps you get referrals but that doesn’t feel systematic or intrusive to the consumer. I had an enlightening conversation with a senior leader in the Financial Services industry recently. With over 40 years in the business, he knew a thing or two about referrals since, over the decades, he has requested and received them from satisfied clients and they remain a key source of his success. He outlined the evolution of referrals within the industry and I thought I’d share some insights and ideas in getting lucrative referrals. The very basics of getting a referral is asking a current customer to provide one, or more. Pretty simple and straightforward. But the industry executive I interviewed indicated that there’s more to it than pulling out a pen and paper. The fact is that even the most satisfied and willing clients often would indicate that they didn’t really know someone who could benefit from the same sound financial and advise and astute planning that they had benefited from personally. That’s when the 3rd P — prompting — comes into play. An effective professional will ask, “Do you have any neighbors that you think might benefit from a consultation?” or “Are there co-workers that you think might need some planning advice?” These and other simple questions help to prime the referral pump, and gets customers to consider specific individuals that might be relevant, and ultimately thankful, referrals. With the advent of LinkedIn, Facebook and other social media platforms, it appeared that life for referral-seekers got easier. One reason for this is because a financial services professional can research the client’s business and personal connections to identify friends that appear relevant. When meeting with the client, some name-specific prompting can certainly get the referral juices flowing. However it can also make an the customer feel uncomfortable and even stalked — not exactly the feeling one wants to engender in an important client. In addition, many of us have online connections that are not truly friends, so the time needed to blindly research names in advance of the meeting might actually be poorly spent. Ideally, professionals are after the prestige referral in which a client will do the contacting and subsequent ice-breaking for you. This might come in the form of a call from the client to their friends about your services. Or even an email. But some clients find themselves tongue-tied or a victim of writer’s block and therefore may not be open to this option. To overcome such objections, some financial professionals will write an email for the client so she/he can forward it to their friend. Unfortunately, chasing the prestige referral in this way turns a straightforward and palatable referral request into an byzantine affair in which your key clients are expected to sign-off on a ghost-written email to their friends. Talk about awkward. Even if a client provides you with the names of relevant friends, the next steps can be laborious and ineffective. If the client failed to provide the referral’s phone number, you need to attempt to locate it. Ditto for the person’s email and/or mailing address. Then, there’s the follow-up actions: cold calls, cold emails, and cold snail mail letters, not to mention additional cold follow-up that’s needed if a response is not forthcoming. Imagine if a simple and affordable mobile app could take care of all the key elements of getting a referral: Prompting, capturing the names, phone numbers and emails of the referrals for follow-up and even allow the client to introduce you to their friends in a way that was simple and non-intrusive. A) You create a referral campaign on your ShareSomeFriends account which includes crafting a short introductory message. Your clients can edit and then will send this message as an SMS to their friends as a part of the referral process (see below). C) Clients select relevant phone contacts to refer and then view and ultimately send the (editable) text message you crafted in the first step. That’s it! Not only is the process of getting the prestige referral simple and fast, but all the information volunteered in the referral process is captured on your ShareSomeFriends back-end for follow-up (so you can finally dispense the pen and paper). 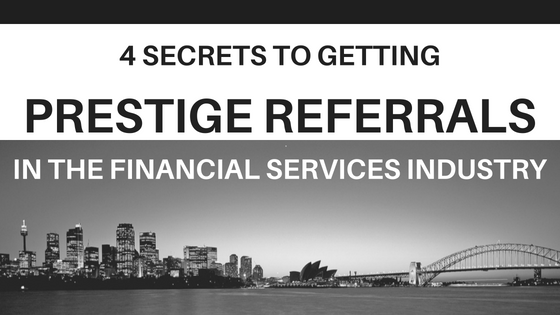 While clearly there is no “right” way to get the prestige referrals that financial professionals need to grow their client base, a new method that capitalizes on the ubiquitous smartphone might just make ShareSomeFriends with its 14-day free trial worth a shot.